Editions : A single edition was published and has never been updated. 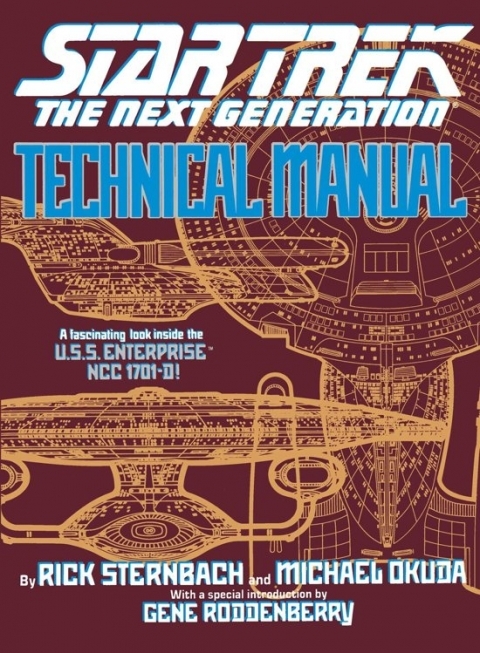 In its day the TNG Tech Manual ranked a close second to the Encyclopedia as the most fascinating of the Trek reference books. Unlike the broad base of the Encyclopedia, the TNG TM focused almost solely on one subject - the Galaxy class USS Enterpise NCC 1701-D. Pretty much everything you could possibly want to know about the ship is detailed here, from a detailed look at the ship's weaponry down to how the waste management systems work.The level of detail is simply amazing - you can find out such arcane details as how many bolts hold the warp core reaction chamber together, what materials a torpedo casing is made out of, how the ship is navigated through space, how big the crew quarters are... a thousand facts that really make the ship come alive in your imagination. There are few problems with the book. To modern eyes the clean black and white orthographic diagrams can seem a little sterile, but while the colour 3D-look images of the following Deep Space Nine Tech Manual can look more impressive, I personally find views like this far more interesting and useful. The biggest issue with the TNG TM is that it's become rather outdated over the years. Writers Rick Sternbach and Michael Okuda both worked on TNG throughout its run, giving them at least a chance of keeping the show in synch with the book, but nevertheless the two have drifted apart over time. None of that is really the fault of the book or writers though, and although it's dated the TNG TM remains a truly fascinating look into the world of Star Trek.